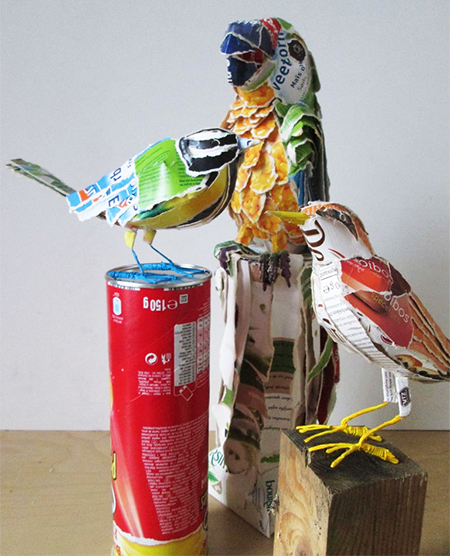 I found these amazing creations on instructables and while they generally have some weird and wacky projects, it's amazing how you can turn cereal and other cardboard boxes into these wonderful bird designs, using a glue gun and a few other supplies. 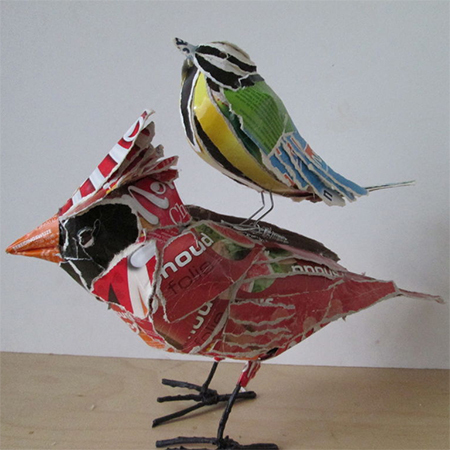 The creator is the birds, Ruud, is a teacher at a school for the mentally disabled. 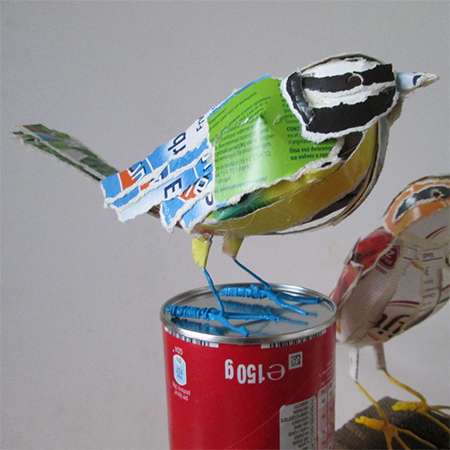 While you might not get it one hundred percent right the first time... persevere and you will soon see how easy it is to make these beautiful cardboard birds. Put together a collection of different boxes, so that you can pick and choose the parts that you want to use to make your bird creations. 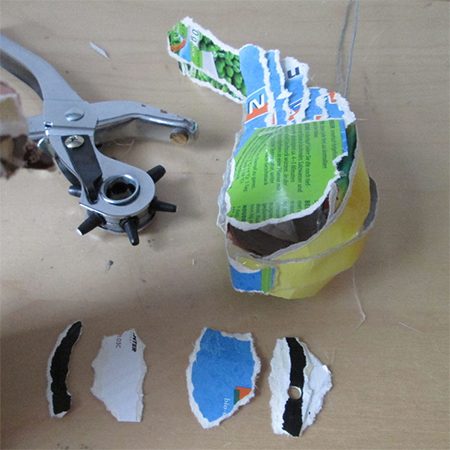 Start by tearing three strips of cardboard for the breast part. Select pieces that have the right colour for the bird you set out to make. 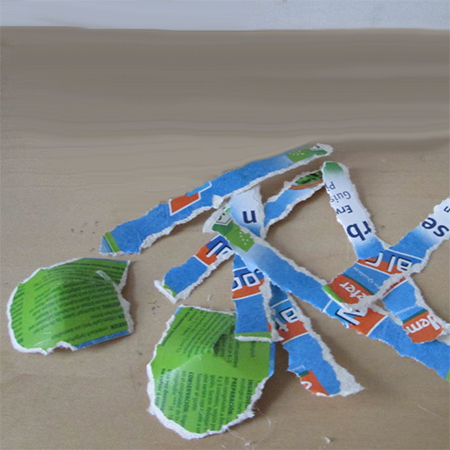 Tearing the strips gives a more natural effect than cutting. The uneven white edges make a feather-like impression, and distort the print on the original box. On top of that it allows you to get away with ill fitting parts witch would look disturbing in neatly cut parts. 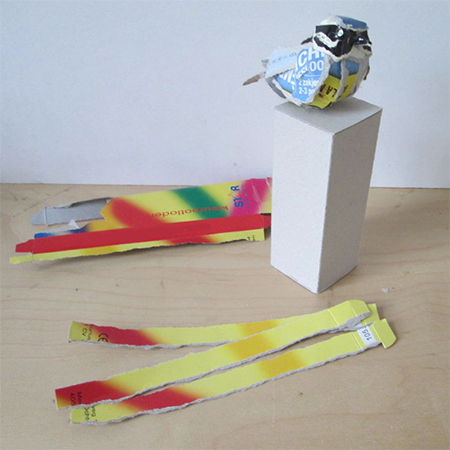 Glue the three strips together in a fan shape. Make sure the middle strip is on top. 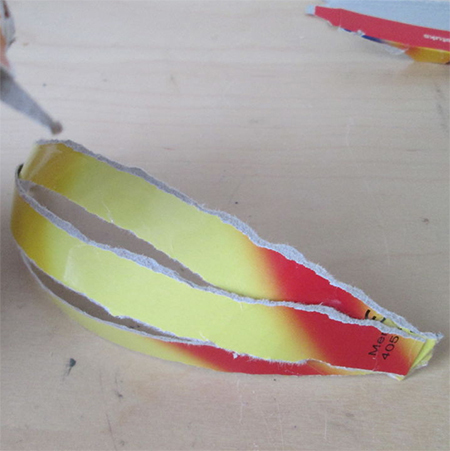 Bend all three strips and glue the other end the same, creating a banana shape. 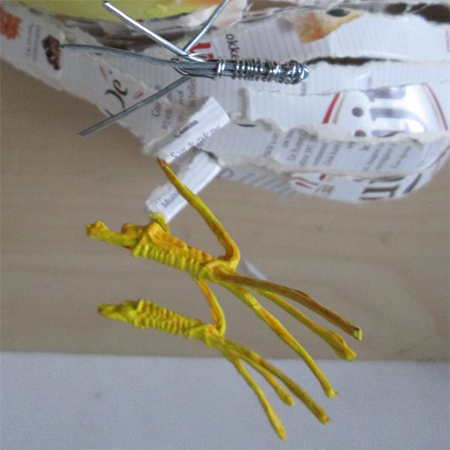 Cut a long length of wire - long enough to fit through the bird body and mould into the legs - and bend it into a narrow 'U' shape. Push this through the strips of the body and attach it with a small piece of cardboard where the head will be. Also secure it with a longer strip across the three body strips where the legs will come out of the body. Below you will see these as the red strips inside the bird body. 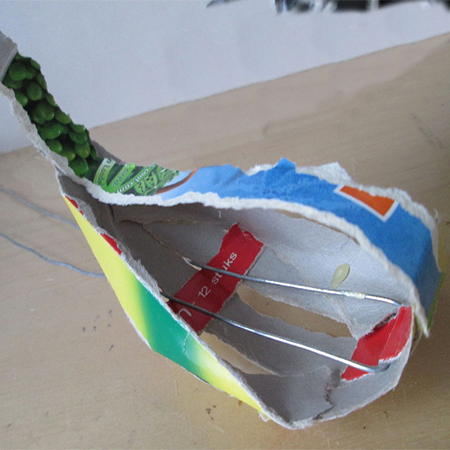 Start adding strips to the side of the body for a more three dimensional shape. If you look above you will see how these strips are folded diagonally (along the length) to make a very wide triangle that fits into the sides of the 'banana' shape. To make the wings tear two 'D' shapes for shoulders and tear these in the middle so that you can bend them over for dimension. Tear four long strips for feathers and shorter strips for the rest of the wing. Glue the wings are glued onto the sides of the body. If you need to lift the wings a little, add a rolled strip of cardboard underneath the shoulder section. 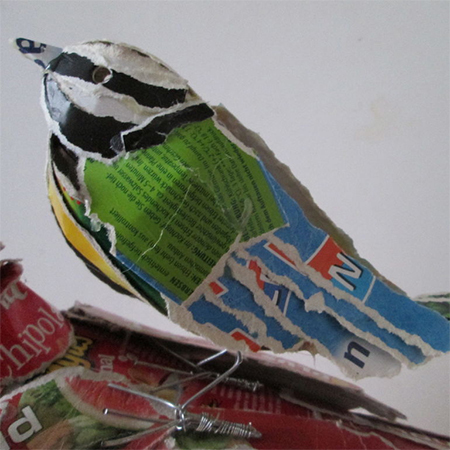 Use coloured strips for the tail and make the shape as close as possible to the original bird. 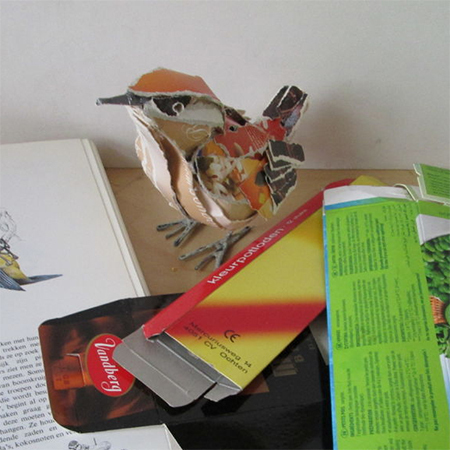 It helps to have an image of photo of the bird you want to make. Glue the strips onto the back section. For the head tear three irregular oval strips with a flat edge on one side - for the top of the head and the other two for the sides. Bend the strip for the top of the head and fit it on the back strip. 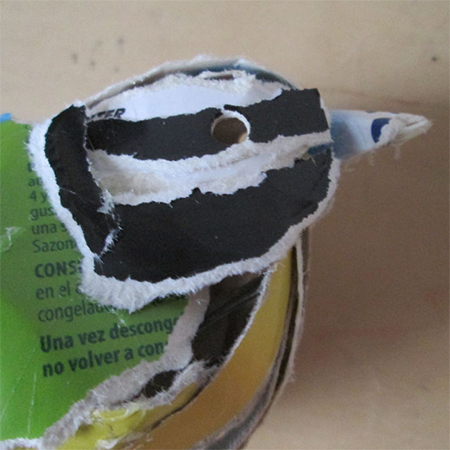 With the flat edge at the back, glue the pointed edge towards where the beak will be placed. Use coloured strips for the sides of the face and punch out a hole for the eyes. Bend in the same way you did with the top f the head and glue to the wings and side of the body. The opening under the head, between wings and body can be covered with additional strips, but it doesn't matter if a small opening remains as this adds to the overall authentic appearance. 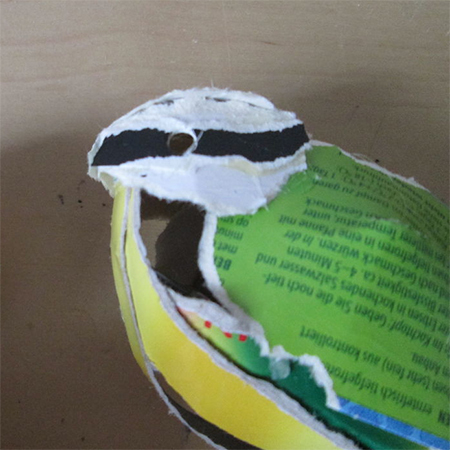 To finish off the beak you can roll up a quarter circle of cardboard and stick this to the body with some hot glue. 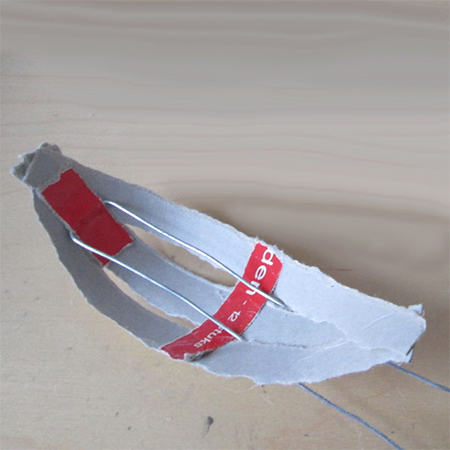 Bend the wire to shape the legs and toes, so that you have three toes at the front and a large back toe. Paint the legs to look like the original bird or to add some colour to the finished piece. You can make a variety of birds, each with their own unique character. Start collecting cereal and good boxes so that you have a selection of colour choices. Try to find the right shape, color and size for different birds.